Listen to The Carters Brothers on "Do the Flo Show"
Back in their '80s boot-legging heyday, Britain's Charly Records issued Blues In Session, the first comprehensive compilation of the Carter Brothers. In the brilliantly snooty, utterly condescending words of English liner-note writer Cliff White—who may or may not have had some personal experience with them—the Brothers were waxed about thusly: "Obscure they were, and pretty short-lived as a recording team, but when they were good, they were very, very good." Then, in parentheses, our faithfully critical scribe couldn't help but add: "And when they were bad they were God-damned awful, however you're not being subjected to their lapses here." Now, you may ask, why would such a quote need to be resurrected? Simply because, whether there's any truth to it or not, it unintentionally encapsulates the genius of the Carter Brothers. I mean, if they couldn't be considered "God-damned awful" on occasion by a British music scholar, well then, what would they be worth after all? Think about it. How many of the greatest rock 'n' roll moments come from bands that have the guts to rush to the edge of the cliff, teeter on the edge of disaster and save it all at the last second before everything falls apart? Or, occasionally even fall flat on their faces? That said, there can be no doubt that the Brothers' raw, juke joint-tinged brand of bluesy Southern soul paints a picture of a certain, shall we say, mystique. And if you've ever swung to their Elmore James-meets-B.B. King-style "Southern Country Boy," their horn-blasting "Stop Talking In Your Sleep," their finely-titled "Booby Trap Baby " or even their exquisitely depressing "Blues In The Bottle," then you know that the energy that blasts forth from these discs makes the said Limey's claim somewhat believable. But in their case "God-damned awful" probably means "God-damned great." Don't forget that there are a lot of people who don't appreciate R.L. Burnside's "Sound Machine Groove" album either! 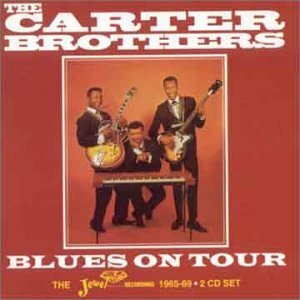 Comprised of Roman Carter on lead vocals and electric bass, Albert Carter on guitar and Jerry Carter on vocals and keyboards, the Brothers hailed from Garland, Alabama. After migrating to the West Coast, they cut their first records, including the infectious "Consider Yourself" for Duke Coleman in 1964. Licensed by Stan Lewis's Jewel/Paula Records, "Southern Country Boy" went to No. 21 on the national R&B charts and can still be found in jukeboxes and truck-stop cassette racks from coast-to-coast. They went on to cut more than six singles, with Roman recording some solo sides for Jewel/Paula as well. The group parted ways in 1967 when Albert and Jerry were said to have been drafted and they've remained elusive ever since, becoming a musical urban (or is that country?) legend. As they well deserve to be.